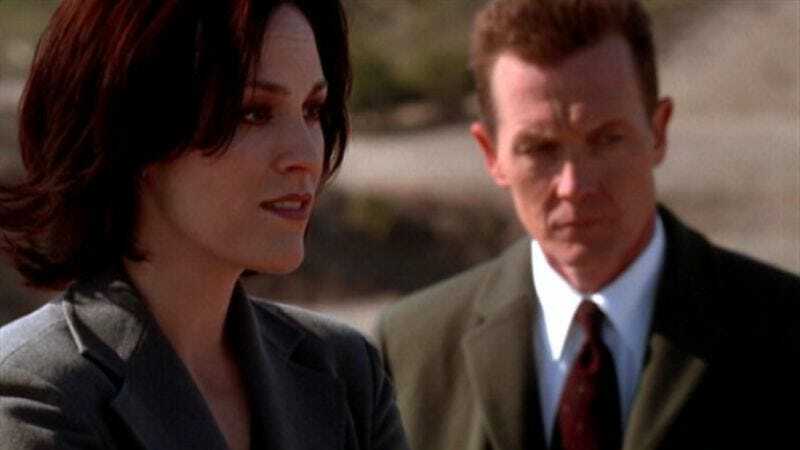 Up until now, most of the talk about who will be in Fox’s X-Files revival has been monopolized by the characters people fondly remember, like Mulder, Scully, Skinner, and The Cigarette-Smoking Man, but we’ve all somehow forgotten about Monica Reyes and John Doggett, the lovable (?) replacements for Mulder and Scully that the show introduced near the end of its original run. Well, here’s some good news for the handful of people who were really hoping they’d come back: One of them is coming back. Robert Patrick—who played Doggett—told The Mary Sue back in June that he’s too happy/busy with CBS’ Scorpion to return to The X-Files, but Deadline is reporting that Annabeth Gish—who played Reyes—has no such qualms. We don’t know how extensive her role in the new series will be, but we at least know that she’ll show up in some capacity. Maybe Mulder and Scully will be talking about some alien stuff, and then Reyes will pop her head in, tell them she’s glad they’re back, and then we’ll never see her again. Or maybe she’s an integral part of the new mythology episodes. We’ll have a better idea when the new X-Files premieres on January 24 on Fox.